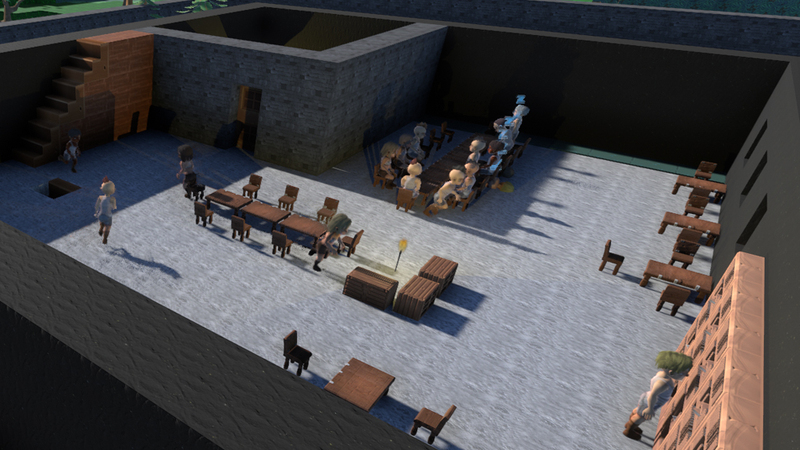 Embark is a deep colony sim in a huge living world. 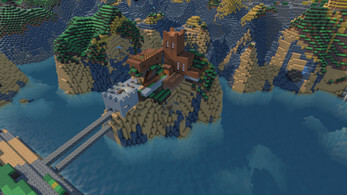 Inspired by the deep simulation of Dwarf Fortress, the open world survival of Minecraft, and the social interactions of The Sims. Embark follows a group of explorers who find themselves on a strange, seemingly uninhabited planet. A fully 3D destructible world allows you to build anything from small trading outposts to huge fortresses. An intuitive interface makes managing your colony easy. Order your people to build complex structures and sit back and watch as they complete them. A source of fresh water is critical to your colony’s survival. Water volume is simulated (and limited!). It flows like you would expect it to. Build pumps and aqueducts to move water. Give them some free time and characters will write books and potentially teach others their skills. Design luxurious rooms to keep them happy Characters in Embark are simulated in detail: They get hungry, thirsty, lonely, or tired. They each have their own interpersonal relationships, social status, and personalities. With the game’s focus on smaller groups each member of your colony is unique and important, and you can really get to know your people. 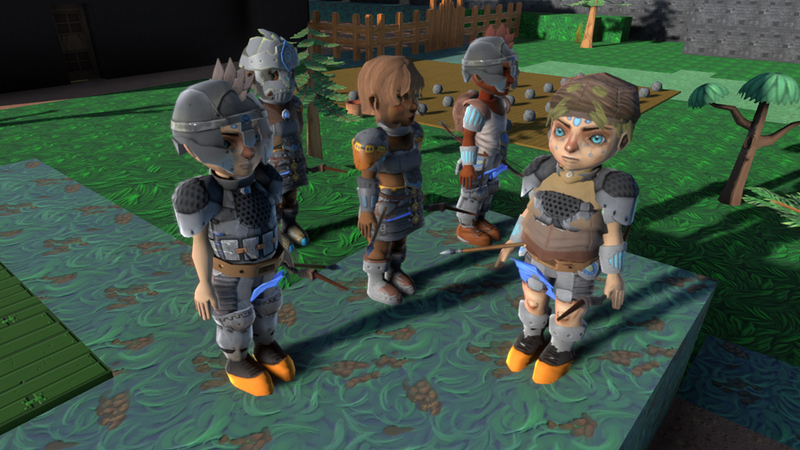 Explore a huge procedurally generated 3D world and meet its inhabitants. The map is over 2km by 2km, over it are scattered flora, fauna, and various factions and encounters. Juggle between building your base and exploring the map for more resources. You will never feel cramped by the looming edge of the map. Modding will be fully supported by Embark. Name a colonist. Name will be added to the database of random names for all players of Embark. Also name an individual creature for one of the mob types. Players will encounter your named creature randomly! Embark is on Steam Early Access on the 18th of April! Indeed where do I find my steam key at? When and how will I receive my steam key? I noticed that you have added this to steam and that it is a 3d version of rimworld crossed with Minecraft with a dwarf fortress feel to it aswell just one question - just like rimworld did will you be adding mod support? No promises there, depends on how well the game does. Unity makes porting it easy but it's supporting the build which I don't have the resources for. where do I find the update patch notes? can I have a link to it? yup! Check out the YouTube channel for devlogs. hopefully things are continuing along in development land. I would like to see or know if there's an intended improvements to the "Generating Terrain" step of making a new game. it seems to be the slowest part. Yup, it's on the to-do list. The problem is everytime it gets more efficient I end up adding more stuff which causes it to end up at the same speed. Part of the issue is the size of the map. Will probably add an option for smaller map sizes in the future. So, due to an issue with my first card denying the transaction until I verified it was legit, I used another card and during the process forgot to look for any links to being able to name a colonist and enemy - I paid $30 - is there a link somewhere? Thanks for the feedback Docdra! For the naming I will be sending out emails to collect the names. The research tree being hidden from the start sounds like a good idea, will try that out. Also will allow the pause key to toggle the game speed. There is a "Look Sensitivity" in the options screen. Thanks maiabutterfly, will be fixed in the next patch. Also the water which comes out of the salt works is similar to normal flowing water. It must be collected in a pool before it can be used. Will be making the output point more clear in the next patch. I too found this game through Nookrium, we have similar tastes in gaming. I like the mix of 2 of my favorite games, Minecraft and Rimworld. Embark has joined my list of favorite games . My colony has 19 people and growing. I've just got the salt works up and running and what an enormous project that was. I thing I would like to be looked at is raw materials. eg copper. I dug a copper vein out of about 50 and got only 2 ores Something which I found bizarre recently is that my researcher isn't researching but I'm finishing the research. Great game. Suggestion: Can we add an option to save profiles of the characters that you create before you start each game? That way I don't have to go through the tedious task of re-creating my 6 starting characters every time I start a new game? So far I love the game. I like how you implemented the saved game feature. I have seen some poorly implemented "save-game" features in other games. Yours is very clean and easy to use. Thanks for the feedback Chimpzilla, has been a popular request, it's on the todo list. Did you encounter any other issues or have more suggestions? Anyone one else having trouble not being able to purchase with Paypal? Hey Fengferth, we switched to using Stripe instead of Paypal, hope that isn't an issue for you. Is the food cooked into meals? Also did you try changing the "rations" setting in the jobs panel? If not it could be a bug, any chance you could email me the save game? It's in your users\appdata\locallow\embark\embark\ worlds folder. Thanks! I have tried changing the rations and the food is in simple meals, don't live long enough to research anything better. I have not had any real saves as all of my games have been very short, but I'll fire up a quick one and send you a save after the first death. Ok I tried to fire up another game and I seem to have lost all my menus, I had this issue earlier and restarted my computer and it fixed it. But thats not working now, I can't even exit the game without force killing the process. So no actual saves but I can send you was in the world files and the error log from the main folder. just need to know where to send it. I think I figured out the food issue I was having, there seems to be some sort of priority on the food you start with. So if you move far away from spawn you have to make sure to make hauling the start food is the top priority because the people "think" they need to eat those first and will starve before they will eat freshly crafted food? Anyway not sure why I keep losing my menus but none of the buttons will pull them up and I can't get the exit menu as the escape button just pauses the game to I have to kill it manually making me have to start a new world. I think the issue is with the UI scaling in the current version. Go to your users/(your account)/appdata/locallow/embark/embark/config folder and delete the optionsinfo.xml file inside. 0.3 is coming very soon and should fix this too. 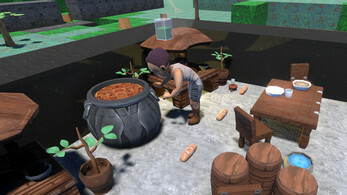 For the food, that shouldn't be possible, they search for food starting from items closest to them. Could it be because the food is inaccessible somehow? They can only walk up or down one block at a time. Is there an ETA for the next update? Or is the game already dead? update is pretty overdue because I severely underestimated the scale of it, but it should be within the next week. 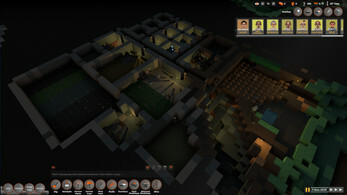 Great game, takes the best of rimworld and stonehearth, can't wait to see how it develops. If we purchase from here, will we get a Steam key when it comes to Steam? Thanks in advance. Thanks for the reply. For what it's worth, it may be beneficial to mention that as part of the above (i.e. the main Embark page) descriptive language as it may garner more support, which I would be happy to see since it would support the game more. That being said, this will be a buy for me. I've noticed if you turn down the draw distance in options the game never crashes for me and then boost it back up in game. options should be clickable,msybe corrupted files? I think the issue is with the UI scaling in the current version. Go to your users/(your account)/appdata/locallow/embark/embark/config folder and delete the optionsinfo.xml file inside. Sorry! is there a way to delete items built in game? im having the same issue, the game freezes at world creation screen. I just purchased the game today. Does it need to be updated? it should be the latest version. Could you check if you have an error.log file in your game folder? If you do could you email us at embarkgameteam@gmail.com. Also could you email your computer's specs, thanks. It doesn't seem to have an error log in the folder, I may be looking in the wrong place. Where would it be located? it should be in the folder you unzipped the game. Is there a 32 bit V? Nope, doesn't work with 32 bit, it is rather heavy on the ram usage now. Keeps crashing when generating world. Ryzen 5 1600 GTX1060 6GB Win 10 64 bit. Please tell me my money was not wasted. 5 tries with same result. Please fix. Hi ItchySkithcy74, Not to worry you can always get a refund if you have problems running the game. Could you email the error.log file in the game folder to embarkgameteam@gmail.com (or send it to me in the discord channel)? If it isn't there there should be one in your Users\(yourUsername)\AppData\LocalLow\Embark\Embark\output_)log.txt. Your latest update has fixed my issue! It is playable now. Thank you very much.